A rather strange tuning that seems to be part of any Mark Knopfler concert these days is the high-G tuning. 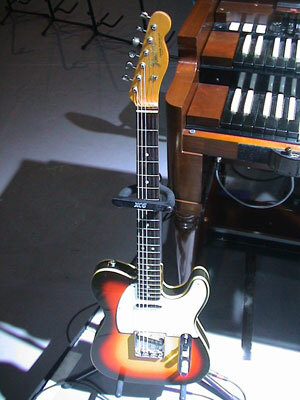 Mark Knopfler owns a beautiful sunburst Telecaster Custom – probably a ’67 that was originally played by his brother David with Dire Straits, more on this guitar in a future post. These days (not in the past) this guitar seems to be dedicated to the high-g tuning. So, what is it? In short: high-g simply means that the g-string is tuned up one octave, all other strings are standard tuning. For obvious reasons the g-string must be a rather thin gauge (I take a 008), otherwise the tension would break the string immediately. On stage, this guitar is played by keyboarder Guy Fletcher on the song ‘Wye Aye Man’, but it seems it was used on some studio recordings as well (besides Wye Aye Man, e.g. for the rhythm guitar on the song ‘Boom like that’, the one that comes in at 0:43 min and only hits each chord once, possibly on some more songs). The nice thing about this tuning is that you don’t have to learn new ways to fret chords because the g-string is still tuned to g, only one octave higher, so everything remains as it is. You can fret each chord as you are used to, only the sound changes, a rather high note is added. Of course things go wrong as soon as you try to play lead with this tuning because the g-string is now the highest note. Basically, the idea of this comes from the so-called Nashville tuning which is the tuning you get when you use only the octave strings of a 12-string set (the high e and b strings remain, all other strings are the thin octave strings, tuned one octave higher than the normal strings). This tuning is often used to add rhythm guitars with a rather “light” sound, less bass, but rich treble end. Try it out, maybe on a spare guitar, it is a fresh sound and a lot of fun at almost no costs. What tuning is Setting me up by Dire Straits, and what guitar? This is very cool! I never knew that. I wish I had more guitars to experiment with crazy tuning ideas like this. Thanks for this post! 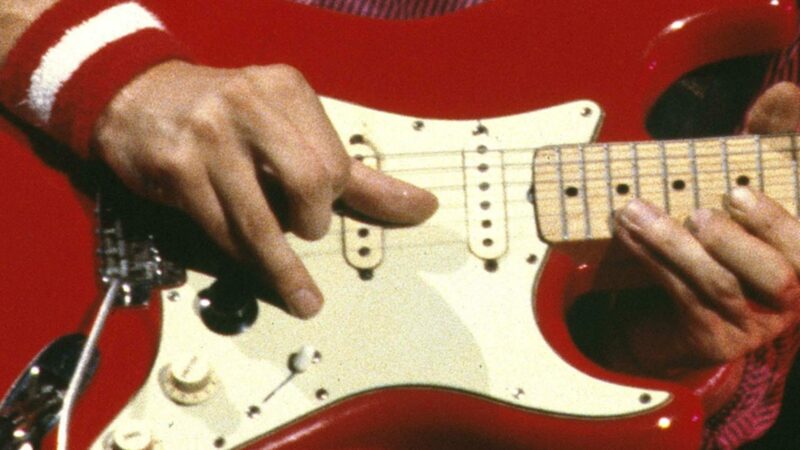 Pingback: Mark Knopfler Guitar / More Knowledge about the guitar » Anything better than a red Schecter Strat? - Yes, two of them. Do you know what guitar Knopfler is playing in the video? I think there’s a little mistake about the fact that strumming chords on Boom like are played with that Tele. According to the list that was published on MK news, this chords are played by RB on MK Strat (as we see on the DVD making of), a Tele is played by mark, but on the left (if memory serves) for arpeggios + that lick at the end of each verse. Maybe this info on Mk news was not accurate. I remember a thing that surprised me : on Sucker row, Mark is only credited on acoustic while RB is on MKstrat. So that lead guitar at the end of the tune is RB ? I’ve read so many posts on mknews forum which says that this guitar remind the sound of Communique… Yes, but it’s not Mark, it’s Richard ! So I doubt about this list (even if it was given by Chuck Ainlay), maybe, it has some little mistakes. Another example : the guitar on Trawlerman is credited LP, but on tour 2005 (and also on Boothbay) Mark plays the 54, and I have a french magazine where he says (maybe mistake of translation ?) that it’s the 54 on this song. Mark plays the riff on the Silvertone I think, and it is doubled (possibly both by RB and MK). That rhythm guitar I mean plays only single chords, it is the one that comes in at 0:45. Lead on Sucker Row seems to be MK, and Trawlerman sounds like the Les Paul to me. Agree about Trawlerman. It sounds also LP to me. But strange that Mark said in an interview that it was the strat 54. That`s why I think things said in interviews are not always true. Mark plays in many sessions with so many gears; he can`t always remember all that stuff specifically. So, sometimes, interviews are not “reality”. We can only rely on what we see on live videos. About Sucker row, it sound also Mark to me, but I have a doubt: why would Chuck Ainlay have forgotten to credit Mark on guitar ? And RB can sounds like Mark. Take for example Summer of love. If we haven`t seen the video where RB plays his Gretsch, who would have thought that this lead guitar was him or Mark? On another example, I have a doubt about the lead guitar on Stretching Out (Wag the dog soundtrack), it could be RB on Gretsch, while Mark plays rhythm on 335, why not? MK rhy elec 1 Fender Telecaster through a Vox AC 15 ïƒ this the one that plays rhythm “arpeggios” + riff just after “boom..like that” (on left channel) Of course this Tele can`t be the high-G because of the riff, maybe the blonde one. RB elec MK Signature Fender Stratocaster through a Vox AC 10 ïƒ (center) this is the one that plays only single chords, the one that comes in at 0:45. (As we see on the DVD. I know it`s only playback, but I think that they must have mimed what they have realy played on the record). So I don`t think that the high G Tele is on this tune. 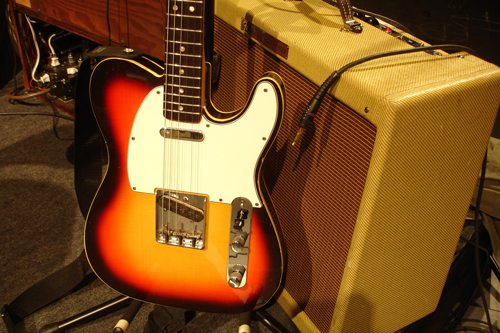 I must admit that I am not sure about the sunburst Tele on BLT. I saw it being played by Paul Brady on that live TV promo and the sound on the recording matches the sound of the rhythm guitar on Wye aye man, that’s it. so, live, this “riff” is played by Richard and not Mark. What you mean by “the riff”, Morten, is the rhythm “arpeggios” I guess. why do you say that the blonde Tele is open G ? – Belle Star (ATRR tour): open tuning ? am I wrong about tunings on this songs, or do you have any information that says this guitar was always open G ? Really blonde tele is tuned in open A? I play “setting me up” in open G and works too well. The ’54 Tele is tuned to standard tuning, I don’t know of any exception. I just had a fast look at youtube, to find out anything about Guy’s guitar playing on BLT. And from what i saw, it was impossible to see what guitar he was playing (but it was a guitar:-)) But I think it sounds like it has high g tuning, so I still vote for the sunburst tele – the same as on why aye man. But in the studio, I don’t know. If the blonde normally is in normal tuning, it probably was that one. Well, it could be any guitar, it’s no problem to change strings and setup from one song to another. I was wondering if you had an idea about Mark’s overdriven tone. I don’t think he would be using a pedal, but if he is then I’d like to find out which one. I’m thinking he just overdrives the amp a tad to get a tougher sound, but if you know anything please let me know. Mark’s overdrive tone comes from the amp. On Boom like that, however, he live used a Hot Cake pedal. Thanks. I actually looked at some videos of the song and saw the pedal. Do you know if the amps he uses have seperate channels like the soldanos or he just sets them differently for each song that reguires overdrive. I’ve seen his amps before but I don’t know much about them.